The Dolly Parton Imagination Library provides FREE books for children ages birth to 5. Each month a new, age-appropriate book is delivered by mail right to the child’s door. There is NO COST to participate for the child or family. Dolly’s original vision for the Imagination Library was to foster a love of reading among preschool children and their families in her home county of Sevier, Tennessee, by providing them with the gift of a specially selected book each month. By mailing high quality, age-appropriate books directly to their homes, she wanted children to be excited about books and feel the magic that books can create. Moreover, she could ensure that every child would have books, regardless of their family’s income. Dolly’s Imagination Library became so popular that in the year 2000 she announced that she would make the program available for replication to any community that was willing to partner with her to support it locally. It has grown from just a few dozen books to more than one million books mailed to children in the United States, Canada and the United Kingdom each and every month! Independent studies have shown Dolly Parton’s Imagination Library drastically improves early childhood literacy for children enrolled in the program and improved scores during early literacy testing. The Dane G. Hansen Foundation is committed to our mission of providing opportunities for the people of Northwest Kansas to lead the highest possible quality of life. 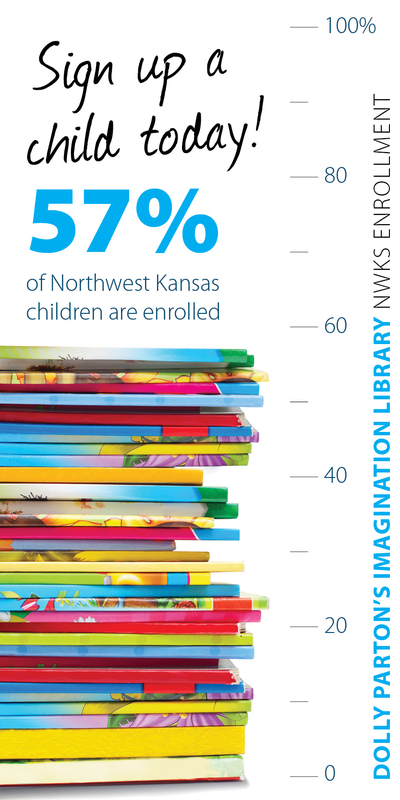 Early literacy is the pathway to learning for our children, and the Foundation wants to ensure that all children in Northwest Kansas have the opportunity to develop critical early reading skills. In addition, the Foundation recognizes that reading to or with a child is an opportunity to build and enhance that child’s relationship with parents, grandparents and other caring adults. Parents enroll their children by visiting the local affiliate or online at www.imaginationlibrary.org. Once approved, within a few weeks, the child will begin receiving a book each month. The Dane G. Hansen Foundation is partnering with local affiliates in each of our 26 counties to offer the program to all children birth to 5 in Northwest Kansas. Administrative costs are covered by the Dollywood Foundation. There is NO COST for families. Any child, age birth to 5, living in one of the 26 counties served by the Dane G. Hansen Foundation is eligible to participate. Multiple children in each family are eligible as long as they meet the age criteria. The Dane G. Hansen Foundation is grateful to the following community partners who bring the Dolly Parton Imagination Library to the children of Northwest Kansas.